"Martha, Martha, you are worried and distracted by many things; there is need of only one thing." The rebuke was not because Martha served instead of listened. Jesus himself came as one who serves. 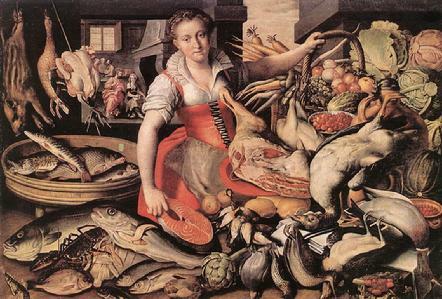 The rebuke was for anxiety and distraction sabotaging Martha's own desire to offer hospitality. Jesus, too, offered hospitality. Mary accepted it. She offered the hospitality of her heart to the Word made flesh. Who doesn't get distracted and anxious? Doing too much good in too many directions (meditation one) is one way of thwarting your own desire to offer hospitality. Rather, seek the one thing (meditation two). Even then, it may be necessary to re-evaluate your energies and sense of hospitality (meditation three). 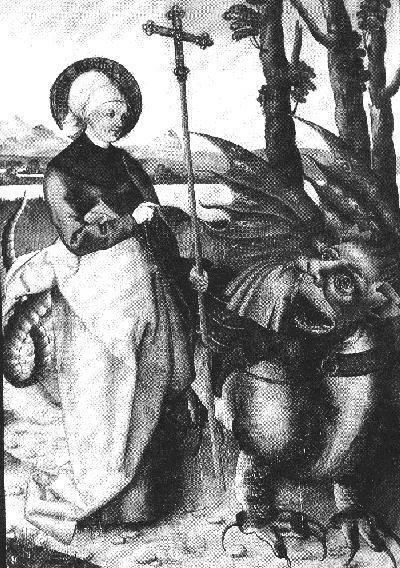 In medieval art Martha is often portrayed with La Tarasque, a dragon-like monster she tamed and bound with her girdle. (According to The Golden Legend, Mary, Martha, and Lazarus escaped persecution by sailing to southern Gaul. - see "Suzanne's Meditation.") Does Martha overcome that monster of anxiety, then? Can overcoming one monster enable her to tame others? I'd love to think so. This we can all bear witness to, living as we do plagued by unremitting anxiety. it becomes more and more imperative that the life of the spirit be avowed as the only firm basis upon which to establish happiness and peace. Today, the great enemies of any such universal hospitality are busyness, fear, and professionalism. If I don't have time to talk to the person calling for help, hospitality is out of the question. The advent of a guest, like the unanticipated needs of fellow monks, is a guage of our use of time. If we have no time for the guest, our day is too full. However, busyness can be an independent sin against the stranger, or it can be an excuse concocted because we don't want to say we are afraid or prefer to remain uninvolved. We cannot be too busy, too professional, too removed from the world of the poor to receive the poor and sustain the poor �. To practice hospitality in our world, it may be necessary to evaluate all the laws and all the promotions and all the invitation lists of corporate and political society from the point of view of the people who never make the lists. Then hospitality may demand that we work to change things. A brother came to visit a hermit. As he was talking his leave, he said: "Pardon me, father, for I have caused you to violate your rule." But the hermit answered: "My rule is to refresh you and send you back in peace." Anxiety, like the common cold, is catching. One person's anxiety at work or at home, infects the esprit de corps like a rampant infection. An unnamed anxiety can attach itself to a perfectly solvable problem and spread from an individual's phantasms to the coffee pot in the course of a morning. In Sunday's Gospel, Martha finds that anxiety sabotages her own hospitality during a visit by Jesus. Like a ballet master, Jesus offers the correction Martha needs to put her in the right balance and direction. I'd like to think of her laughing, if not in the flush of the stressful moment, at least by the time she'd sat down to eat supper herself. And maybe she took that rebuke and turned it into a discipline of virtue. How else do you explain the taming of the horrible Tarasque? The Golden Legend tells about Lazarus, Mary, and Martha and their friend Maximillus escaping persecution in the early days of the church by sailing to Gaul. Mary preaches and eventually retires to a mountain to live the ascetic life in a cave within a cliff, where angels lift her seven times a day to sing the Opus Dei in heaven. Meanwhile, a monster terrorizes the countryside. The destructive human-eating Tarasque has six bear's legs growing out of an ox's body, a lion's head, a back like a turtle shell with spikes, and a tail ending with a scorpion's stinger. Martha faces the ancient monster alone and charms it, armed only with holy water, a cross, and her own sweet character. Good thing Jesus clipped her over her anxiety all those years ago! Tamed, the she-monster comes back to civilization leashed by Martha's girdle. But a sad ending awaits the Tarasque. The frightened people destroy Martha's pet. Southern France immortalizes the Tarasque in fiberglass or paper mache parade floats and in village statues and church paintings. Sadly, ubiquitous holy cards portray a willowy white-skinned Martha and a small, lovely nonthreatening dragon curled round her feet. Neither look like they've conquered anything, especially a monster like anxiety.